An equine pre-purchase examination is strongly recommended prior to acquiring any horse. Horses can be a huge financial and emotional investment for an owner. The pre-purchase examination includes a conformational analysis, a full physical examination, a gait analysis with flexions, an ophthalmic examination, and a neurologic examination. The horse is typically evaluated on a lunge line, in hand, and/or under saddle. These evaluations can be accompanied by further diagnostics such as digital radiography, ultrasonographic evaluation, and/or laboratory analysis (blood work). An upper airway examination can also be performed as part of the pre-purchase evaluation. 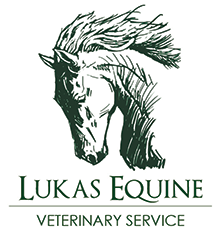 Lukas Equine is equipped with a portable on-site endoscope and gastroscope (cameras used to view the upper airway, trachea, esophagus, and/or stomach). A pre-purchase evaluation by a veterinarian can help to determine if the horse is suitable for the intended use and more specifically the intended rider. To schedule equine pre purchase examinations, please contact us at your earliest convenience.